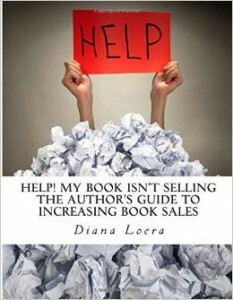 In this informative book for authors, Diana walks you through – step by step – the process to determine what may be the reason that your book isn’t selling. She then helps you get your book on the fast track to sales. You’ll learn about the two hottest marketing avenues right now and how successful authors are using them to catapult book sales. Plus you’ll take a close look at your book and ensure there isn’t a tiny hidden flaw that could be your barrier to sales. 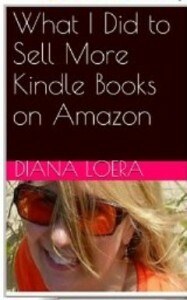 Diana is the author of over a dozen books from recipes to health to marketing to wholesale and more. Click here to see all of the books by Loera Publishing. My name is Josh Slone and I wrote this book to help people like you achieve more flexibility in their life by creating a Freelance Writing Business on the Side. This can be accomplished by just about anyone, and you don’t need a degree. A basic knowledge grammar is nice, but it can all be learned. You may have seen books, websites, and make money blogs that claim teach you how to make extra money online fast. Some may even look legitimate. You just don’t know if you have the know how to do some of these tactics. I used the strategy in this book to make$1200 in my first 3 weeks. I don’t have an English Degree, and I had very little (like none) writing experience before I started. But this business has allowed my wife to work less, my family to eat healthier, and to take more vacation time to travel (we can work from anywhere!). None of it would be happening if not for me beginning to freelance. There are so many people, places and websites that need writing and they are just searching for someone to write it. I am finding new clients every single week, and there are plenty more. 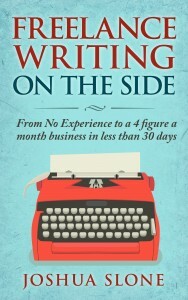 If you have been freelancing already this book may not be for you, but I like to think that there may be a tip or two for even experienced writers. This book offers a straightforward, simple plan for you to go from where you are now to a full fledged content provider. All of the steps in the process can be done in less than 30 days, but are made to be flexible and fit your lifestyle. You can be earning money within days of reading this book! Get started now and follow all of the info and resources to earning a side income that will help you and your family live better all from home! Do you struggle to write every day? Many people dream of becoming a successful author, but can’t *find* the time to write. The truth is this: Great writers don’t have more time than you do. They make time to write. Not only do they make time, they also follow specific routines that help them avoid writer’s block altogether. By developing the “writing habit” you’ll have the confidence to sit down in front of a computer every day, knowing the words will come. YOUR GOAL:: Write 2,000 Words a Day — Every Day! One of the key factors to effectively developing ANY habit is choosing a specific, measurable goal. So if you want to become a prolific writer, then you’ll need to choose a specific word count for each day. While I *suggest* 2,000 words as a goal, you can pick any number that fits in with your busy schedule. You might choose 500 or 1,000 words a day. Or, you might have more time than I do (or write faster than I do) and choose to write 3,000 or 10,000 words each day. The important thing is to establish a daily word count goal and then stick to it. 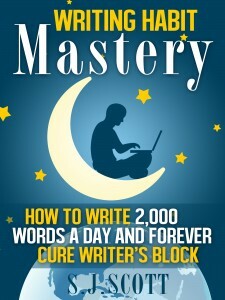 In “Writing Habit Mastery” you’ll learn how to incorporate writing into your daily routine. What you’ll get is a strategy and list of tools that will help you develop a sustainable writing habit and demolish writer’s block. S.J. Scott believes that the way to improve yourself is to set achievable goals and develop daily habits that move you towards these outcomes. That’s why he publishes actionable books that help you immediately develop positive habits. 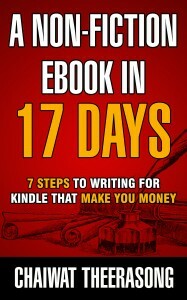 Publishing eBooks is a fast-growing opportunity to make money online. Never before could you be your own boss, write what you love, publish your work easily, and wait for money to come back to you. Unfortunately, most people approach the Kindle platform the wrong way: they just produce books that have no qualities readers are seeking. So, when they don’t make any sales, they leave the field and think the business of publishing eBooks is dead. That’s why I created a guide to help you see the right way to write for Kindle AND get the results fast. It’s not about quantity, but quality. Success with Kindle isn’t often about writing what you want as fast as possible, but instead to write the content that customers really want based on their frustrations and needs. Matching customers’ wants and needs with the RIGHT information is the first step towards eBook publishing success. You need a PROVEN framework that helps to get your book done fast. It doesn’t matter how much you can write in a minute, it’s a matter of using a step-by-step strategy that helps you structure your writing process to be productive. And you can do this within the next 17 days. Have you ever wanted to write a book or screenplay that changes people’s lives? Do you want to leave a legacy behind for your friends and family? What’s your story? Transformed by Writing: How to Change Your Life and Change the World with the Power of Story unleashes the healing power of storytelling. Author Robert Hammond reveals his personal journey of recovery and transformation using creative writing as a therapeutic tool to assist in overcoming addiction and self-destructive behavior. 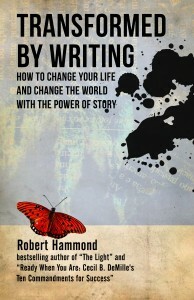 Providing practical tips and advice for people who want to become published authors so they can shine their light in the world, Hammond offers a clear blueprint for writing your book and adapting your stories to film and television. Change your life through Journaling! Learn how to easily Channel messages from your Higher Self, Angels and Spirit Guides. Do you know what Automatic Writing is? Have you experienced its guiding power in your life? 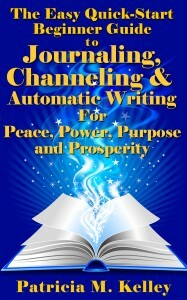 This quick-start guide will launch your power to receive messages through Channeling and Automatic Writing while Journaling. Enhance the Peace, Power, Purpose and Prosperity in your life now! Patricia M. Kelley is an Intuitive, BIG CHANGES Business, Life and Wholeness Coach, Change-Catalyst, Entrepreneur, Speaker/Emcee, Activist, Writer/Author and more. 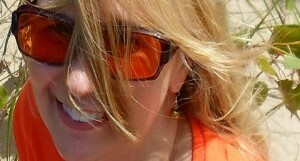 Her current writing interests include: Turning life’s big lessons into purpose and prosperity, uncovering and living one’s life purpose, making BIG CHANGES in Business and Wholeness/Health–including a new series of ebooks on alternative healing methods to Stop, Heal and Prevent Cancer and other dis-eases. Patricia’s articles have been published internationally. Are you seeking a top-notch literary agent? Do you want to be published by a well-known traditional publishing house? The 7 Top Tips in this book are critical components to your success. Use these 7 Top Tips and you will maximize your probability of receiving serious consideration by an agent or publisher. These tips are all about what is KEY to stacking the odds in your favor and getting a favorable response from agents and publishers. 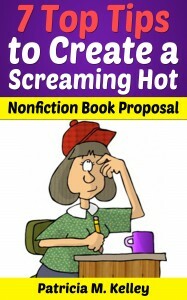 You’ll need to show them a book proposal that “screams” fantastic concept, superior marketability and outstanding professionalism.